YouTube has thousands of free English video lessons. There are hundreds of English teachers posting amazing English lessons each and everyday. Every topic or question you may have has already been answered on YouTube. Click Here to subscribe to my YouTube Channel and get new English lessons weekly. Being an English teacher, I also enjoying learning other languages on my spare time. This year my goal was to improve my Spanish. I have been listening to some Spanish Podcasts on my spare time on my way to work while driving my car or on the subway. I went on a short trip to Mexico and found myself understanding the locals and being able to speak short sentences. Podcasts are a fun and easy way to learn a language anywhere and any time. Speaking English, and understanding English can done through videos and podcasts. Improving your writing skills is another story. One of the ways to improve your English writing and even reading is to join an active forum or English Facebook group. Forums and groups are great places to join a discussion, ask questions, and correct one another mistakes. Click Here to join the English Funcast Facebook Group. We would love to have you as a member. Reading is one of the most important aspects of learning a language. You must read if you want to learn anything. The better your reading level the better you will become in that language. Remember to start out reading books in your language level and slowly start reading harder and harder books. 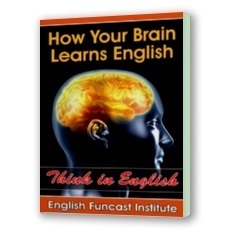 Click Here to get our FREE eBook on how your brain learns English. It will change the way you learn English. Only you can make your English language dreams come true. The truth is that there is no secret to learning a language. The only person that can achieve your goals is yourself. You must stay motivated and work hard. There is a saying: “The more you put in, the more you get out.” This is the only truth to any success in life. The ones who succeed are always the ones who work the hardest. At the English Funcast we try to make learning English as fun and enjoyable as possible. Learning English is hard work but at least we try to make it fun. English Funcast Video: Are you bigger than?